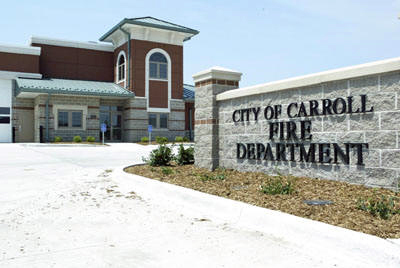 The City of Carroll is proud to be served by 35 dedicated volunteers who answer between 70 and 100 calls each year. Of the 35 volunteers, 26 are certified as Iowa Fire Fighter 2 and 5 are certified as Fire Fighter 1. Construction of the new 14,500 sq. ft. Carroll Fire Station started July 25th, 2005 and was completed in July of 2006. Badding Construction Company of Carroll served as the general contractor for the project. Total cost of the project was nearly 2.3 million dollars which includes purchase of land, engineering fees, construction, and all station furnishings. Carroll’s new fire station is situated on 4.67 acres and is located at 801 N. Bella Vista Dr. on the eastern edge of the City of Carroll. The building itself was constructed utilizing concrete block and steel with all areas being protected by a fire sprinkler and alarm system. The apparatus bay area has room for 10 firefighting vehicles with nine overhead doors and space for 35 sets of protective gear utilized by firefighters. Included in the apparatus bay is a hose tower used to wash and dry the fire hose. An electric winch is used to raise and lower hose in the thirty-foot high tower. Also contained in the eastern portion of the hose tower is the emergency generator capable of producing electric power to sustain the building’s operation during power outages. The apparatus bay has several adjoining rooms with the first being a radio room. This room is used for communications between the fire station and emergency scene apparatus and personnel. The second room is the decontamination room utilized for general cleaning of equipment and personal protective equipment that may become contaminated with products of combustion or other hazardous substances during emergency response. The third room is the compressor room. This room houses the department’s high pressure breathing air compressor and cascade system used to re-fill self contained breathing apparatus cylinders used by firefighters for respiratory protection during firefighting evolutions. The fourth room is a general storage/utility entrance room. This room houses the electric service panels and all communications equipment for the building. The room also contains shelving for equipment storage. Carroll Iowa Fire Department MapLocated in the north portion of the building are the offices, training room, exercise room, bathrooms and sleeping rooms. There are currently two offices being utilized; one by the Fire Chief and the other by the Assistant Chief and Training Officer. The training room is used weekly by firefighters for regular meetings and various training activities. Attached to the training room is a kitchen area utilized to prepare lunches for the firefighters after regular meetings. An exercise room with a complete line of exercise equipment is available to firefighters. All of the exercise equipment was purchased as the result of a FEMA Assistance to Firefighters Grant in 2004. A sleeping room area has also been added to this facility for future planning. As our community grows so does the possibility of full-time, around the clock firefighters. A room containing three beds has been added to cover this possibility for future use. This sleeping room will also be utilized by volunteer firefighters assigned to the station for overnight duty during severe winter weather to better serve our community. In 2006, the Carroll Fire Department received a FEMA Assistance to Firefighter Grant to purchase "Sparky and the Pumper Truck, " a robotic teaching aid. Sparky is a remote-controlled fire truck that a "behind-the-scenes" firefighter can control and move about. The firefighter operating Sparky can hear and can communicate fire safety messages with children as it moves around the room. The design and concept of Sparky and the Pumper Truck is to capture and maintain a child's attention as the firefighter promotes fire safety and prevention.